This Chassis allows up to 15 1x4 switch modules. Modular construction allows smaller configurations that may be expanded later by adding more modules. 2, 4, or 8 wire modules with CAT6 RJ45 connectors. Add Switch Modules and a Control Module to complete the system. RJ Series - Cytec Corp. The RJ Series of computer controlled switching systems are designed for physical layer switching of multiwire signals om RJ style connectors. Since the system uses mechanical relays it acts exactly like a piece of cable which makes it perfect for testing networks without altering the signals or regeneration. These systems are typically used for Ethernet LAN 10BaseT through 10KBaseT, DSL, CAT5 through CAT6A cable testing, USB up to 2.0, RS422 up to 8 wire and many other applications switched over RJ45 connectors up to 8 wires. They may also be used as lab automation switches, network testing switches, patch panels, network redundancy switches or any number of physical layer applications. 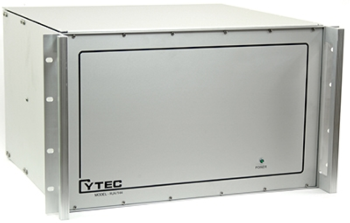 This Chassis controls up to 12 RJV 12x1 modules, 6x4 modules, 4(1x2) modules or specialty modules. Add Switch Modules and a Control Module to complete the system. 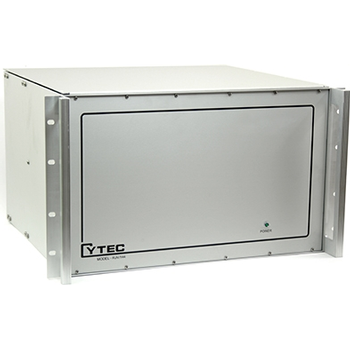 This Chassis controls up to 4 RJV 12x1 modules, 6x4 modules, 4(1x2) modules or specialty modules. Add Switch Modules and a Control Module to complete the system. These switch modules use 2 pole relays to provide up to four pairs based on the EIA/TIA 568 pin out for RJ45 connectors. Modules may be ordered switching one to four pairs. Pairs are pins 1-2, 3-6, 4-5, and 7-8. The most common configurations are 4 or 8 wire modules. This Chassis allows matrix configurations of 16x8, 32x4, two 16x4's, or two 8x8's. Modular construction allows smaller configurations that may be expanded later by adding more modules. 2, 4, or 8 wire modules with CAT5E RJ45 connectors. Add Switch Modules, display / driver modules and a Control Module to complete the system. The Dual 8x8 configuration has been tested and passes Gbit Ethernet Signals.